Piranhas might have razor sharp teeth andthe ability to communicate but I'd rather have them feast on my body than this Pacu Fish. Why? Well, you see, the Pacu Fish has human-like teeth and loves to bite off testicles to ensure you die a slow, ball-less and bleed-full death. Ow. 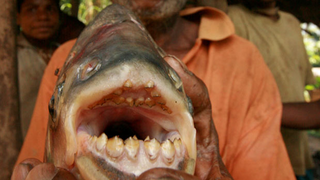 According to The Telegraph, the Pacu Fish is known as the 'Ball Cutter' in Papua New Guinea where locals have reported two deaths due to the impossibly scary Pacu Fish testicle bite. I kid you not. As improbable as it sounds, the Pacu Fish goes to town on the balls of fishermen and swimmers when they're in the water. I guess they enjoy the tender delicacy? I DON'T KNOW. Imagine that thing gnawing at you. EESH.